Creating a hub of digital services to better serve the public and reduce demand. 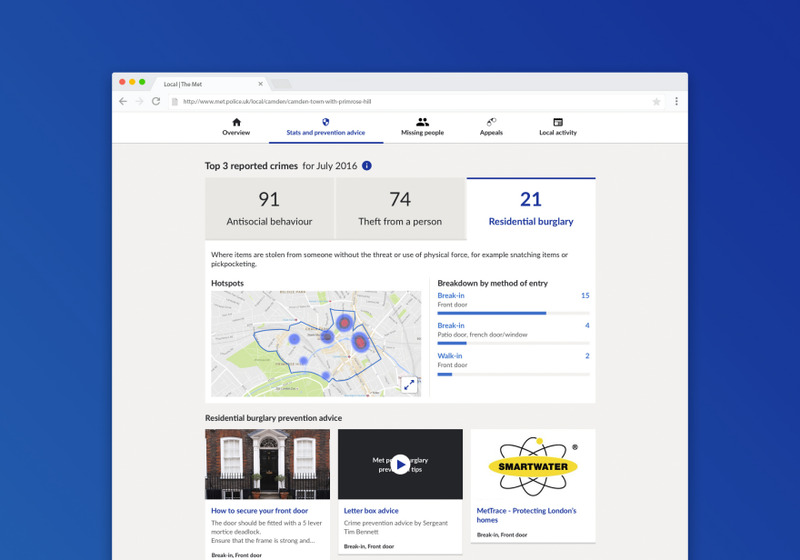 Since 2013, we have worked with the Metropolitan Police (the Met) to develop and implement a customer centred strategy, answering both the needs of the police and the public in the 21st century. 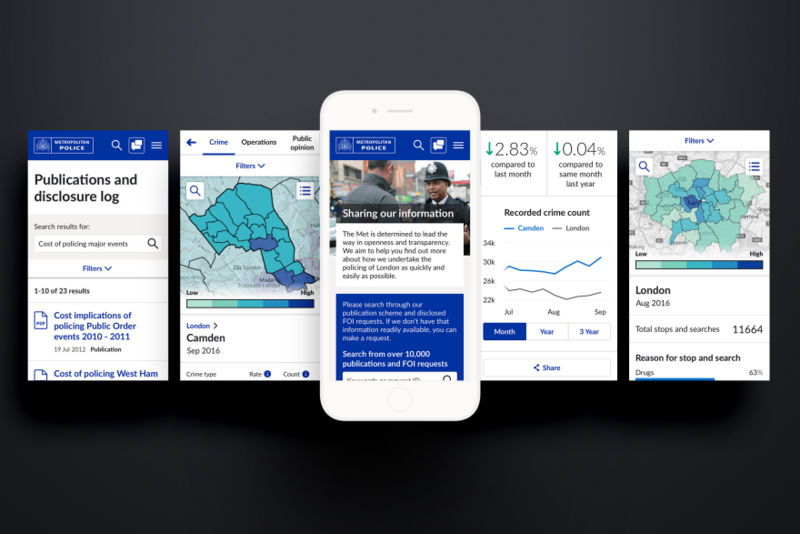 Our vision is and continues to focus on addressing the universal public need for a digital channel as helpful, personal and reassuring as approaching an officer on the street. Critical to our success has been transforming the organisation in parallel. You can't bring offline services, online, without addressing how this new system will work within the remit of officers and staff's day-to-day activities. We were fully embedded within the Met, ingraining a more agile and customer-centric way of working - even training 1200 officers. We know that people come to the Met website, primarily because they're trying to carry out a task. 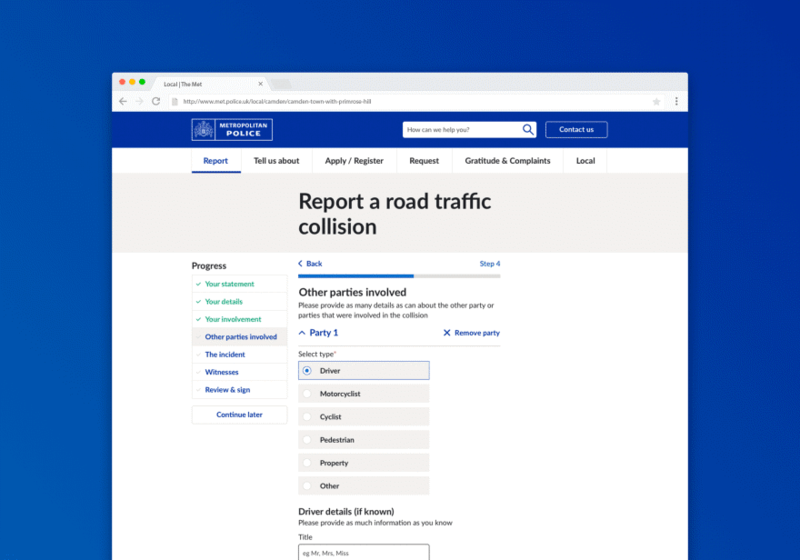 The design and content strategy is centred around this insight and directs members of the public to the service they're looking for, as quickly as possible. Using interactive triage tools and online forms, the site is always action-orientated, quickly and simply narrowing down the options down to get to the specific advice or form most relevant to the individual. Making the public self-sufficient and offering new online reporting options for crime and road traffic incidents, has helped the Met reduce the volume of people that would have called for information, freeing up staff time to be used in new ways. Signs of channel shift first have been clear since the beta launch. The volumes of online reports already form a significant part of the overall demand compared to the phone or paper forms and we can also see a reduction in calls regarding topics where the website provides new online service. This is constantly improving; throughout the project, our work has been highly iterative - co-creating and testing with users all along the process. The launch of beta in October 2016 allowed us to continue this testing on a much larger scale, using analytics, business metrics and user feedback to continue to make improvements. Now, several months in and without any external advertising of the new digital services, we are seeing significant impact on quality and speed of the reporting. This is just the beginning for providing a better service for the public, reducing demand on the Met and keeping London safe - the future for digital has just begun.